Prepare to Scream with Laughter! Back in February of 2002, just over ten years ago, I went to the cinema with a group of friends for my ninth birthday. The film we saw was called Monsters, Inc. - and we all loved it. Jump forward ten years to today, and Pixar's Monsters, Inc. still remains as one of my all time favourite films; with it's entirely unique premise, laugh out loud humour, awe-inspiring spectacle and scope, catchy jazz soundtrack, and the two lovable leads Mike (Billy Crystal) and Sulley (John Goodman), this timeless classic is simply irresistible! Which is why the news of their return fills me with glee, and any doubt that it may not work is safely removed with the hilarious new teaser trailer released today. Monsters University, set prior to the events of Monsters, Inc. and thus making it Pixar's first prequel, follows the story of how Mike and Sulley met at university, where it seems that they didn't instantly become the best friends that we know them as. Who ever thought they'd see the day where Pixar make a college teen movie 'eh? Genius! The new teaser trailer promises huge laughs as we are reunited with our favourite two monsters, both of whom are seen with a new lease of life in their younger forms: Mike looking a more radiant green with his retainer filled mouth, and Sulley looking skinnier and scruffier than ever before - from just the visuals alone you know it's going to be good! The real heart and soul of the original film lies within this particular relationship, and it is that more than anything that made Monsters, Inc. the much loved film that it is. Therefore it is nice to see Pixar delving into this relationship once again with a new film that promises to maintain the same heart and soul as the original. So what are you waiting for, check out the new teaser trailer below; and for any die hard Monsters fans out there, Pixar have actually released four variations of this trailer, each with a different one-liner from sleeping Mike - see if you can find them all online, then leave a comment in the comments section below if you do. Monsters University is released in cinemas across the UK on July 12th 2013. 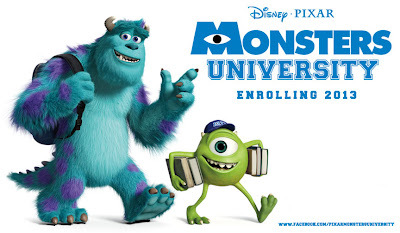 Are you looking forward to learning more about Mike and Sulley's history, or should the past be left in the past? Will it be a blockbuster or lacklustre? Leave your comments below!